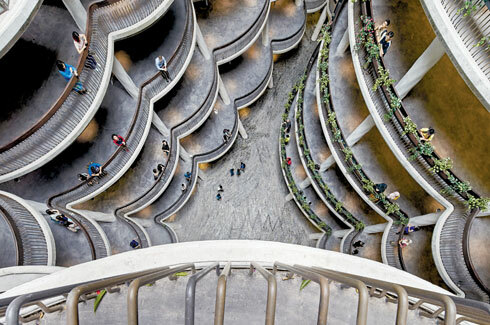 The trendsetting sustainable design of a Learning Hub for the Nanyang Technological University in Singapore by London based Heatherwick Studio redefines spatial perceptions of university learning environments. The lift lobbies and bridge connections as seen externally. Fluted glass surfaces with rain protective materials cover bronze staircases. Combinations of semi covered walkways provide the indoor outdoor connection in various parts of the building. Thomas Heatherwick, principal and founder of London based multidisciplinary design firm Heatherwick Studio, is a well-known figure in today’s design realm with global award winning projects. An Honorary Fellow of the Royal Institute of British Architects, Thomas is also a Senior Research Fellow at the Victoria & Albert Museum, and has been awarded Honorary Doctorates from the Royal College of Art, University of Dundee, University of Brighton, Sheffield Hallam University and University of Manchester. In 2013 he was elected a Royal Academician by the Royal Academy of Arts, London. 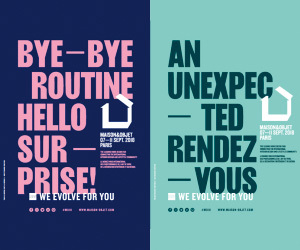 The studio’s body of work is diverse, one that includes the Olympic Cauldron, the New Bus for London and the award winning UK Pavilion for the Shanghai World Expo in 2010. Upcoming exciting projects dot different parts of the world and include a museum of contemporary African art in Cape Town and several large public space developments in Abu Dhabi, Shanghai, London and New York. Rethinking the diktat of traditionally designed classroom spaces that foster hierarchical functions of a teacher at the head of a lecture room, the NTU wanted spaces that would encourage contemporary ways of learning. 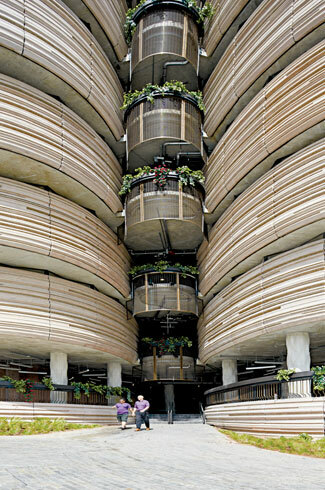 View of the balconies that face the atrium within the building from a higher floor. The conical shape of the tower allows for shade to the lower floors as the shape of the balconies change at every level. This came from the fact that today’s students use several modes of digital devices to learn. The design of the Hub needed to foster classrooms that were non-hierarchical and spaces where learning went beyond the classrooms and encouraged interaction between professors and students across various disciplines. Interpreting this opportunity of a new age learning system, the designers created an architectural landmark that creatively promotes interaction through its unique design. The design outcome is a series of twelve eight storied towers that are inter connected and designed around a central atrium. Each of the towers houses circular classrooms or pods that visually open through large glass openings towards the central atrium. The classrooms house circular tables that encourage group discussions between students and teachers. 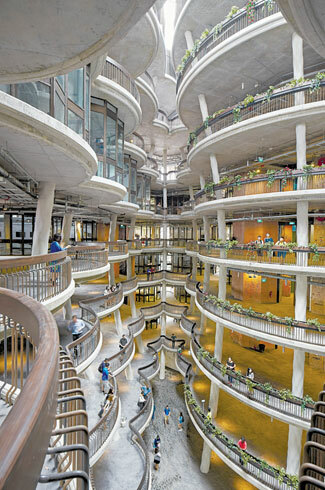 Each of the towers has open balconies that are connected and face the atrium in which interaction is facilitated creating a dynamic environment for learning and exchanging ideas. 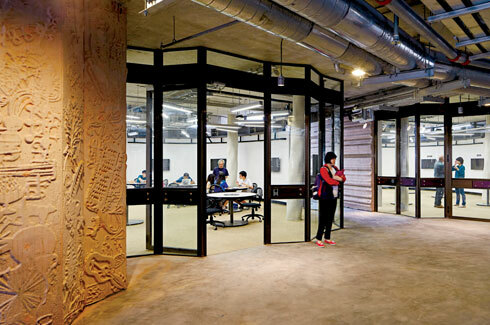 The towers are designed as a stack of these classrooms and narrow down towards the base. The centre facing balconies provide shade for each lower floor by reducing the solar glare. Controlled amount of natural light enters through the main skylight above the central atrium. 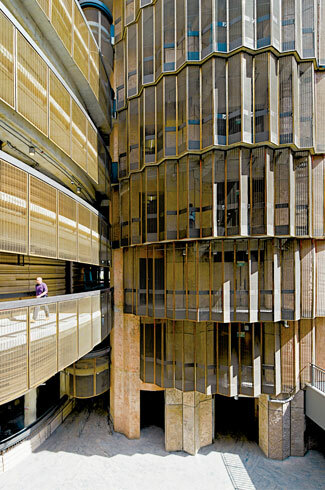 Openings between the circular towers allow for natural ventilation in the central atrium, corridors, staircases and lobby reducing the dependence on mechanical air conditioning. Also adding to the green tag that the building conforms to, was the introduction of natural foliage within the building on some floors and on the terrace rooftop gardens. This provides a cool indoor micro climate and respite from Singapore’s humid tropical climate. Full glass fenestrations in the classrooms that face the atrium allow for a visual porosity to the classroom. It’s no wonder then that the Learning Hub was awarded the BCA Green Mark Platinum Award for sustainability by the Singaporean government in 2013. 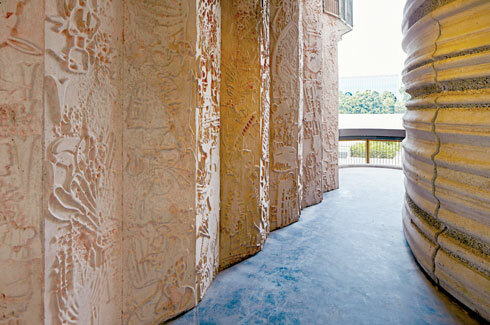 The environment friendly design saw the design team using form finished concrete as a finishing material for the buildings. The design challenge of softening the concrete look within the building was ingenuously achieved by cladding the surfaces with bespoke casted concrete panels in the concrete stair and elevator cores. Drawings related to science, art and literature by illustrator Sara Fanelli, who was commissioned for 700 special drawings, were cast onto these concrete panels. These provide a point of interest and discussion within the building while adding a new visual relief to the starkness of the concrete. The complex, curved, undulating and textured concrete form of the external facade was achieved by casting curved concrete panels with unique horizontal patterns using adjustable silicone moulds. Additionally the sixty one angled concrete columns were also developed specifically with an undulating texture to conform to the texture play of the towers. 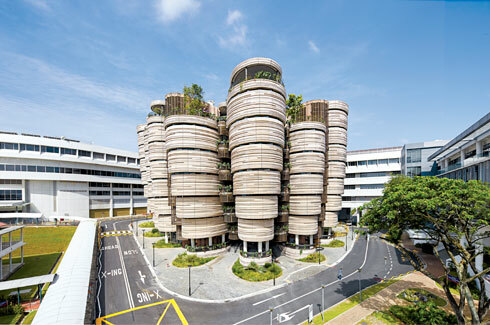 The Learning Hub has brilliantly interpreted the brief of the NTU to establish not only an interesting building in a tropical environment but an educational landmark that adeptly acknowledges the changing learning methods of the 21st century and one that has embraced modernity and sustainability with equal spirit.